Honda has officially launched the new Civic at the Paris Motor Show 2016. The British-built family hatchback gets lower running costs, more safety kit and aggressive styling. It will reach UK showrooms in mid-2017 and start from under £18,000. ﻿The new Honda Civic is offered with two petrols engines and one diesel. The range will start with a new three-cylinder 1.0-litre unit with 129PS and 200Nm of torque from 2250rpm. A larger, more powerful 1.5-litre unit will also be offered, with 182PS. Diesel buyers will get just one choice, a 1.6-litre diesel with 120PS. The four-cylinder diesel is effectively a modified version of the 1.6 i-DTEC found in the current car and – like the petrols – will be available with a six-speed manual or CVT gearbox. Honda hasn’t released any economy ratings, but tell us that running costs will be low, with the diesel officially exceeding 70mpg. The new Civic gets more aggressive styling and a lighter chassis than before, weighing 16kg less and being 52 per cent stiffer than the outgoing model. The Civic also sits 20mm closer to the road and gets more direct steering, which should make it better to drive. The interior is completely different, with thinner front pillars and a wider windscreen. Owing to the wider and longer body, the Civic gets more space between the front seats and increased legroom in the back. The old car's two level instrument binnacle is gone and replaced by a colour seven-inch TFT screen, which will allow the driver to customise the display to enlarge the speedometer or show navigation instructions. This primary display is flanked by two smaller colour screens that display coolant-temperature and fuel-level. The bootspace is almost identical to the old Civic, with 478 litres and the rear seats can be split and folded, while the low boot sill height and wide opening (1120mm) should make it easy to fit large items. The boot also gets a flat floor, with a hidden underfloor compartment. 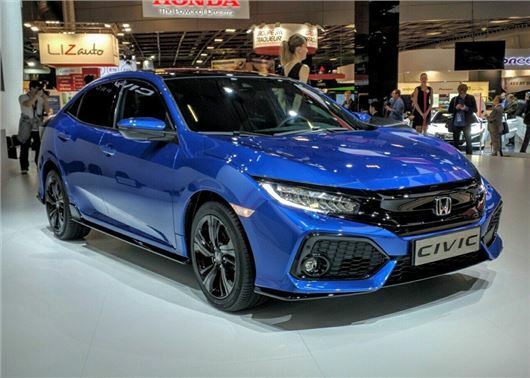 In addition to the new design and engines, the Civic gets a comprehensive range of active safety kit, with blind spot monitoring, lane keep assist and a smart cruise control system that will anticipate traffic that might cut in front of the driver. Honda has also developed a traffic sign recognition system that will prevent the vehicle from exceeding the local speed limits. Despite the predictions of a post-Brexit apocalypse, Honda has pledged to keep building cars in the UK. This means the new Civic (like the old one) will be built in Swindon. Honda has invested heavily in its UK plant, which means Swindon will now produces one Civic every 69 seconds. But does it have a spare wheel or space-saver tyre as standard?